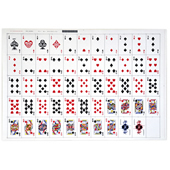 Each uncut sheet contains up to 55 cards customizable on both front and back. Playing cards uncut sheets are a must for all Kickstarter playing cards projects. 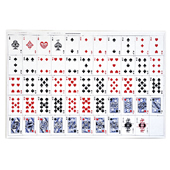 They are a collectors item for all card players and enthusiasts. We print custom uncut sheets with no minimum order quantity. Just create your design and order them from us. There are 55 cards to a sheet with the above specifications and you can choose from different card stock options. Rolled up carefully and put into a hardened cardboard tube for maximum protection during delivery. Uncut sheets are taken straight off the press and varnished. If you have a Kickstarter project, offer your backers the chance to get their hands on the uncut sheet version of your playing cards design. These are highly sought after.